Wazdan rising fast in the online casino software industry. I remember just a couple years ago hearing of an online slots games creator called Wazdan. Come to find out, the company’s been around since 2010, but few (including myself) had even heard of them. Wazdan had just released a new game called Bell Wizard. It was being heavily promoted, but I found it odd that anyone would mesh a dark wizard motif with typical fruit machine symbols. The graphics were nice and crisp, but the theme didn’t catch on. The firm’s portfolio slowly grew, but didn’t make many waves until mid-2017 when a series of new games with more interesting themes and unique features appeared. The gory Haunted Hospital Slot was an instant hit with horror buffs (like myself), and when the Valhalla Slot came along, its 3D graphics earned Wazdan a well-deserved moment in the spotlight. Since then, the company has been developing games at a much faster rate, and with more creative themes that appeal to a wide range of players. The company’s shining star is its ‘Unique Wazdan Features‘; a series of innovative bonus features that can only be found in their patented games studio. In the last two weeks, Wazdan has released 4 new online slots games, including award-winning titles 9 Lions and Double Tiger. They have another 4 scheduled to launch on September 18. The company has secured licensing deals with well over a dozen online casinos in recent months. Clearly, Wazdan is focusing on rapid expansion, and it’s attracting the attention of some very important people—namely, their players. 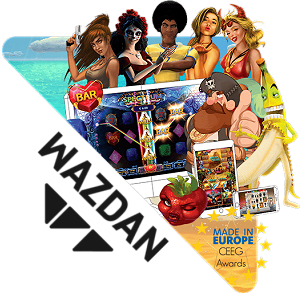 It was announced in a press release this morning that Wazdan has been shortlisted for 4 awards at the third annual Central and Eastern Europe Gaming Conference (CEEG). The shortlist is decided by online casino players via a 30-day online voting forum. That’s quite an accomplishment for an 8-year old company that most people hadn’t heard of prior to 2016-17. “We’re honoured that Wazdan has been shortlisted with so many other prestigious names in the industry,” said Andrzej Hyla, Head of Sales for the online casino software firm. “Our ‘Passion for Games’ means we are dedicated to providing our partners with the most advanced technology in the industry to create the most immersive and exciting gambling experiences. The third-annual CEEG Conference, hailed as a “bombastic gaming seminar” by organizers, is just a few weeks away now. The summit, and ensuing awards ceremony, will take place on September 25, 2018 at the Ritz-Carlton in Budapest. Final voting for the winners in each category will be cast by delegates in attendance.